"The Clumber Spaniel is a gentle, loyal and affectionate dog. He possesses an intrinsic desire to please. An intelligent and independent thinker, he displays determination and a strong sense of purpose while at work. A dog of dignity, the Clumber Spaniel may sometimes seem aloof with people unknown to him, but in time he will display his playful and loving nature. The Clumber Spaniel should never be hostile or aggressive; neither is acceptable and should not be condoned." 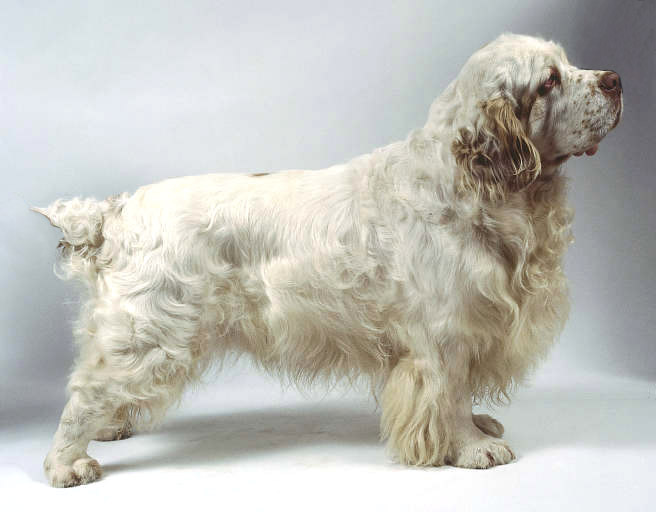 The Clumber is of such unique type in comparison to the other spaniels that his origin is particularly shrouded in doubt, however, there is much evidence to suggest that the breed may count Basset Hounds, early Alpine Spaniels, and various other breeds among its ancestors. It is believed that the Clumber was one of the first specialized breeds, originating in France possibly as early as the 18th century. Theory holds that at the time of the French Revolution, the Duc de Noailles of France moved his kennel of spaniels to England for sanctuary, housing them at the kennels of the Duke of Newcastle at Clumber Park (hence the name) in Nottinghamshire. The popularity of the breed was rigidly guarded by members of the English aristocracy in the district known as the "Dukeries." Clumbers were first shown in England in 1859. The breed arrived in America relatively early, entering Canada in 1844 with a member of the British army, and the first Clumber registered with the American Kennel Club in the late nineteenth century before the AKC itself was founded (the AKC accepted a few records of pedigrees that were older than the actual club upon its founding in 1884). A standard for the breed was drawn up shortly thereafter in England, with considerable controversy erupting over the size and exposure of the "haw" or part of skin that covers the eye. Eventually, the AKC standard settled that "some haw may show," definitively ending the debate as it established the breed in the Sporting Group.